It’s a party. Or an outing. All of you who have digital cameras obviously love your cameras and love taking pictures. 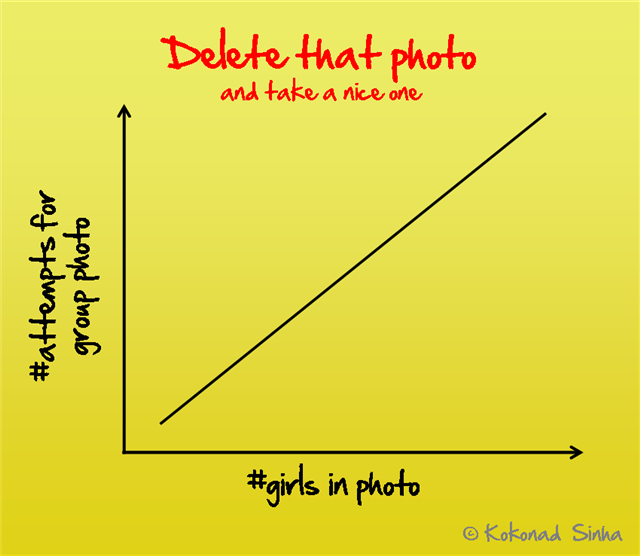 Whether it is a single profile shot, or a small group shot, you are often told to delete a pic. These are some of the issues because of which I am told to take a picture again, and delete the previous one. Now analyzed by gender. Girls, you look absolutely fabulous. We guys love to have you in our photos, and we admit we generally don’t have an eye for detail(led flaws) – but we earnestly love to see you with that carefree laugh, with the surprised look or that absolutely mesmerizing stray lock of hair. Ladies, you look gorgeous. Always. You brighten up our photos. You bring life to them. 🙂 Guys, back me up on this. Yayyy Koke back in full swing. 🙂 I love this one because it’s OH SO TRUE! Heh, I’m guilty of quite a few of those reasons for taking another picture, heh, It’s just because we want to make sure the picture turns out perfffecttt. 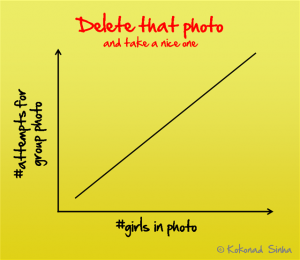 haha….that graph is funny…though somewhat true..
that is way too funny. and very true. and in the case of my mom, it starts before that. you can not take candid pictures, not in home clothes, night suits, without lipstick, kaajal and major hair combing. all our candid pictures look like they were taken on the way out of the beauty parlour! agentgreenglass´s latest post – Slide and lift and slide and drop. No, not dead. LOL! I dislike being photographed for the exact reasons you ticked off! 😀 Good one Koko … !! …a big smile in version1 of the photo quickly turns into a forced, weak, pained smile by version[n]. sore cheeks. waise, i m more picky regarding TAKING pics rather than being in them! i m in search of the perfect frame 😛 but i love natural poses too… artificiality takes away the life of it! Dharini´s latest post – How true.. I even get requests to delete comments they’ve left on teh blog so that they can comment something more intelligent again! Funny and well-written. I wonder whether being a good photographer helps or hurts you. Apparently, the girls are so hung up on ‘eye-candy’, they fail to comprehend ‘candid’. Pity. eeek! is that my nose??? Aaah, where do I even begin! I know I know… girls want it to be perfect and all… but we guys find you gorgeous outside of a photo as well! You can tell a photographer to click again. But can you tell a guy to look again? 😛 Thanks for the comment! Thank you, thank you. Oh yes. Moms never want to be photographed candidly. You’ve hit the nail right in this matter! Welcome to my blog, Perplexed! I must say I love your blog, and you have a new subscriber! 🙂 Regarding your comment, yeah but you look so great candid! And we guys don’t care if you have a lop sided left eyebrow! 🙂 No, really! We don’t! Thank you, thank you. I am glad you liked it! You? Dislike? Photo? Hair? Seriously? Sunday? Lauki? If anything, you photograph wonderfully! ATHHHGBG. 😀 😀 You have NO idea how much I kicked myself for forgetting that! THAT ONE is the primary reason for my retaking pictures! How could I have forgotten that while writing the post when it really was the inspiration itself! Grrrr. I am glad you liked it! 🙂 Welcome to my blog and thank you for commenting too! 😀 Ha ha ha ha ha! Join my club, Ashwathy. I am going to quote a very dear friend who commented this on my facebook account. 😀 I am sure you will enjoy it! Ha ha ha ha ha! I just introduced that feature in my blog! People can now edit their comments for up to 5 minutes after posting it 🙂 I should thank you for reminding me to do it! Thank you ji, thank you 🙂 I think in the long run, a good photographer helps you! Which reminds me, you have not posted anything new in your flickr account for a long time! Thanks Chelli! But I do hope I never end up actually overworking my humor nerve! Roshmi´s latest post – Shubho Bijoya and a very Happy Dussehra/Vijayadashami… !!! Thank you, thank you 🙂 Shubho Bijoya to you too!! tangerine´s latest post – Fly away home. 😀 Actually you know what… we do, but we are just too embarrassed to admit it. Except for the shoes bit. But let’s just keep all that to ourselves, won’t we! Also, this is your second comment on my blog! Welcome to my blog! I will never get to replying to comments on the Ramayan post… that thing is beyond me! #Borna: You are absolutely, absolutely, absolutely right! In fact from the next time on, I am going to think a little about these implications too! 🙂 I typically just draw a dependence randomly – I always did exponential curves and thought I will do linear for a change… and didn’t quite think it through. Aside, welcome to my blog! 🙂 And thanks for commenting. 🙂 Welcome to my blog DJD… I hope you meant ‘you didn’t find a blog so funny’ and not ‘you didn’t find this blog so funny’! But thank you for commenting! Hope to see you visiting again! Hey, i have been reading a number of blogs lately. . . BUT . . . i found ur blog utterly creative and awesome. . . read some of ur blog posts . . . specially dat “ramayan and facebook” one . . . dats one’s fantabulous . . . beautifully written . . . This blog post was so hilarious! Looks like girls complain more than guys do! I can prove that. My friends and I will take 10 photos for instance, but will only approve 3 “perfect” shots. This scene’s very common with girls. I had a good laugh, thanks for sharing this post! lol back u so that u wudnt have to take as much retakes? Oooh come on, you’re being silly! It’s funny, people who love taking pictures are always so critical about how they look in pictures. I’m sure you look fine, I’ve seen pics, you’re perfectly adorable Koke! As for my photographer friends, I think the one picture of yourself that you’d love is a picture that someone else takes of you – – while you’re taking a photograph. Those always turn out awesome. 🙂 I’ve taken a candid photo of a friend while they’re so concentrated on taking a picture, and it just works so well! Thank you Girlie, I am glad you liked the post and it made you laugh 🙂 I am sorry for the ludicrous delay in replying to these comments – but I do hope you drop by again! Heh heh heh, may be you should have a do/do-not list while on a trip too! 🙂 It’s a pity you are on hiatus now – your lists are so much fun to read! May be your next post could be on things not to do in the US…? Great post, I wonder how many times I have thought this way. i love to be photographed as this posts sounds to me that am I always this picky?..haha. True and hilarious..I am impressed as I know you understand a girls mind very well. Your wife/ Girlfriend is sure one hell of a lucky women ! Ooooh no! I don’t think I understand a girl’s mind at all! 😛 I wish, but no. I will use this comment as testimony though! Siddhartha´s latest post – What’s your food type?